How much time do you spend watching Instagram stories every day? I know for me it’s a substantial amount! In fact, I’m almost always watching Instagram stories before I even look at the new images in my feed. What about you? If you’re in the same boat, that says A LOT about Instagram Stories. They’re powerful, captivating, engaging, and of course fun! 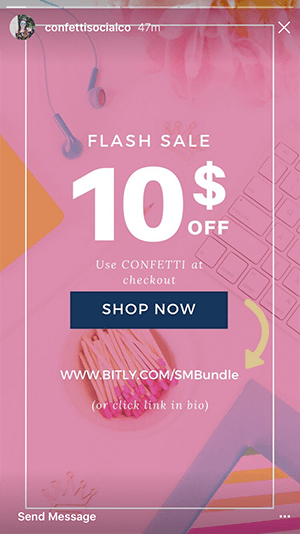 If you haven’t added them to your Instagram strategy yet, you need to! With over 800 million Instagram users watching Instagram stories every day, by not posting any to your account, you’re missing out on a huge potential to build your relationship with your audience, increase traffic to your feed and boost your engagement rate! So strap in, this tutorial is a long one. 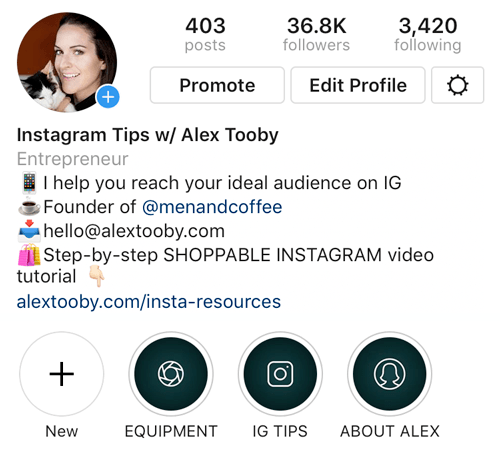 I am going to walk you through ALL of the features within Instagram stories so you can start effectively using them on your feed! 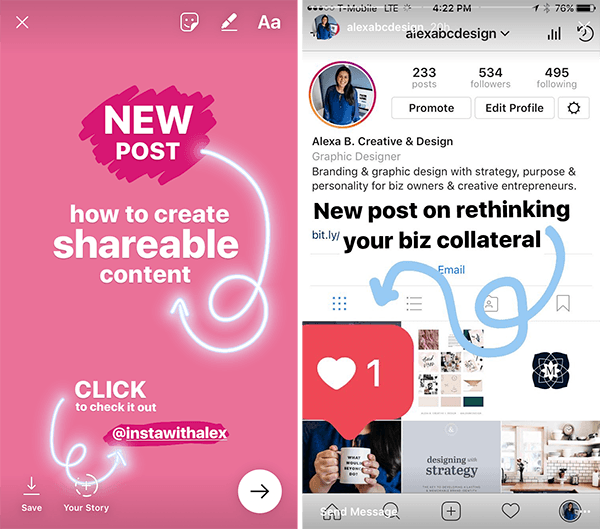 If you are not certain how to do these things, please refer to this blog post before starting the below tutorial: How To Use Instagram Stories – A Basics Tutorial. 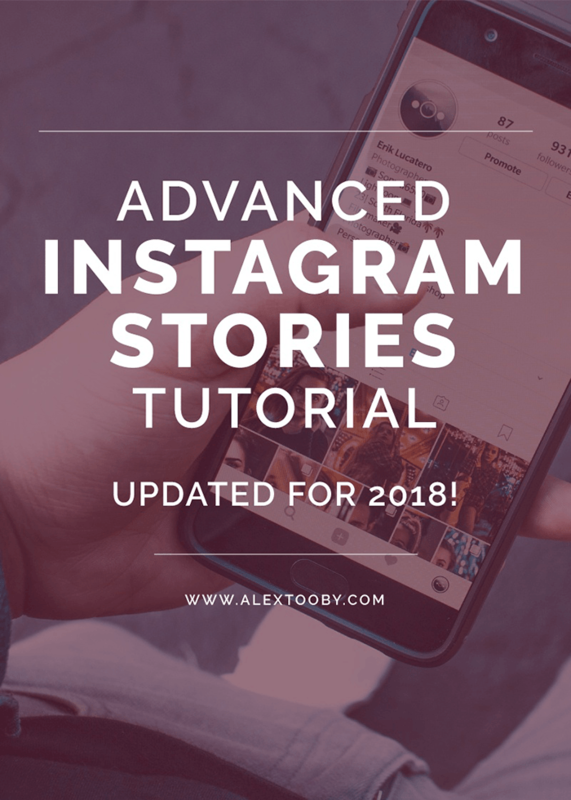 *Note: not every user will have access to all of the features listed in this tutorial - Instagram 'rolls out' their features to users at different intervals depending on a variety of variables such as location and account size. Always make sure your Instagram app is up to date when checking for features. Boomerang: this style takes a burst of photos, then loops it over and over to create a moving image. To take a boomerang, simply tap the record button once and wait! A number of photos will be taken very quickly to create your boomerang. To create the best boomerangs, make a small but deliberate movement while it’s recording. For example, winking to the camera, sticking your tongue out, or jumping up and down. These are an engaging alternative to video or photo! ∙ Tap the small music icon that appears above the record button and select your style. Rewind: this style simply plays your video in reverse. Hands-Free: this style allows you to record a video without having to keep your finger on the record button. It’s perfect content like makeup tutorials, demonstrating exercises, teaching sign language, etc. To create a stop-motion sequence, take a photo, then move your camera or object slightly, then take another photo. Continue this process until your ‘movie’ is done, then tap ‘done’ and watch your video come to life! 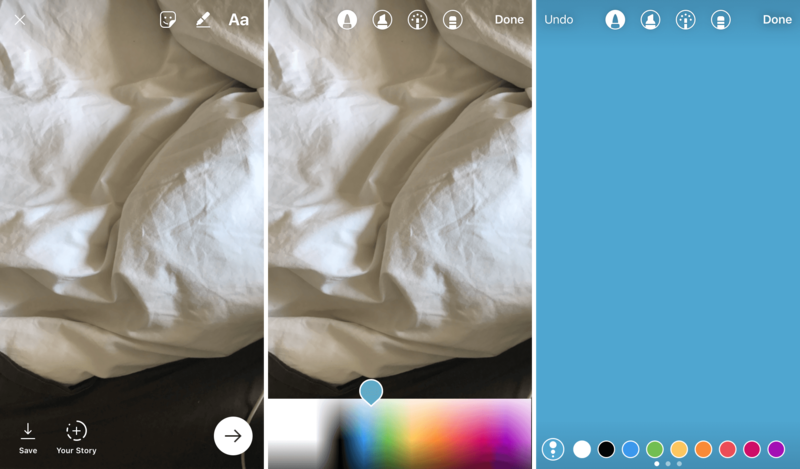 ∙ Select a custom color by pressing and holding one of the generic colors, then dragging to select a color from the palette that appears. Now you have the perfect blank canvas to create with! 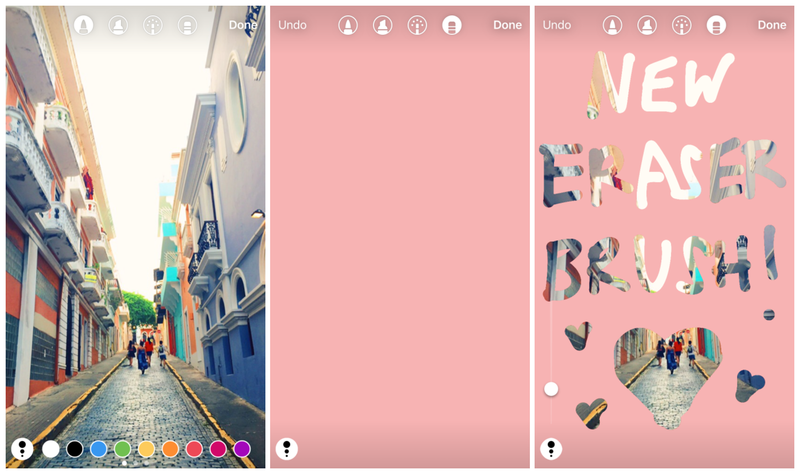 By using a solid background and the eraser you can create a fun peek-a-boo effect in your Instagram stories! Adding text seems pretty basic but you can really do a lot by simply adjusting the size, font and color! By adjusting the size of your text you can have really big words surrounded by smaller ones to emphasize importance and create visual variety. 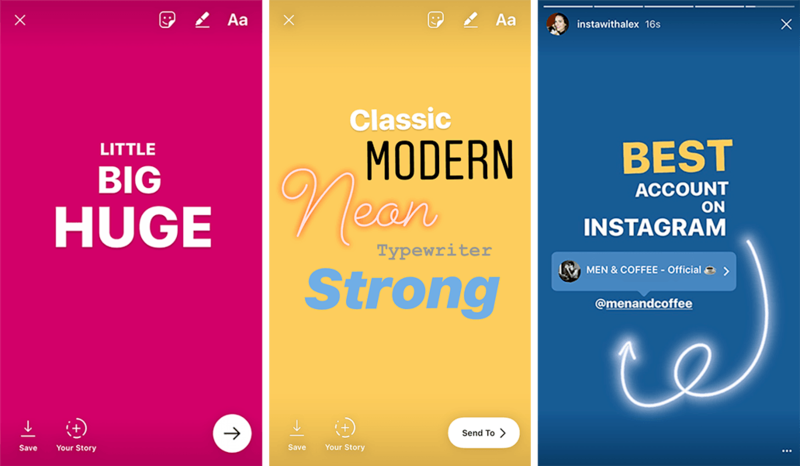 You can also change the style of the font by tapping the ‘Classic’ button in the top middle and cycling through the five options (Classic, Modern, Neon Typewriter & Strong). Combining these two can make for really eye-catching graphics. Another great thing you can do with the text feature is @ mention Instagram accounts and turn those mentions into live, clickable links! To do this simply type the @ symbol followed by the name of the user you want to tag. When you publish your story and click on the text you just added, a small bubble will appear with the users account, and when clicked on, will take your viewers directly to their page! This feature also works for hashtags. 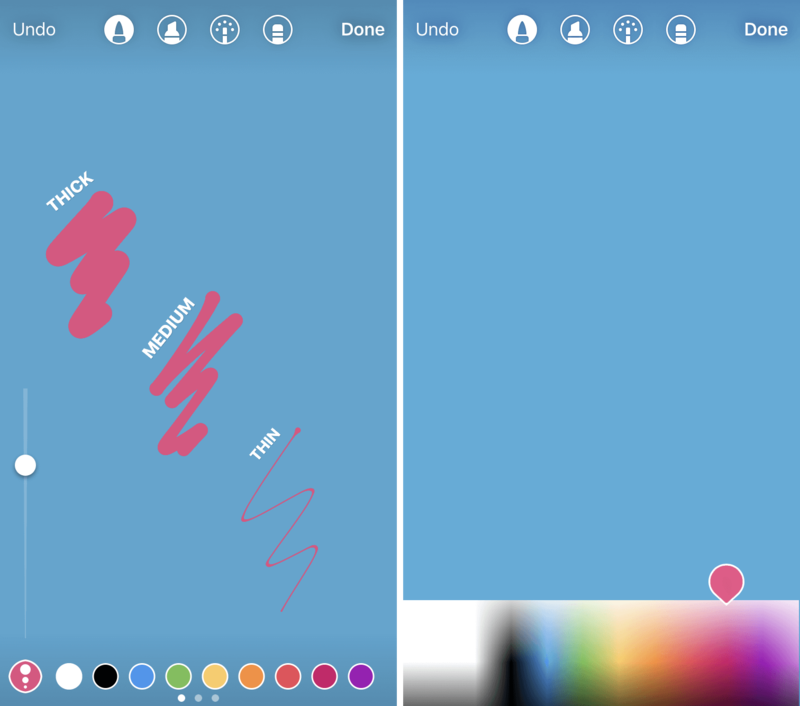 On top of customizing your Instagram stories with text, colors and markers, you can also add a variety of “stickers” to your content. These fun little additions allow you to really amp up the creativity while also helping you reach a wider range of people. Use this sticker to add a location to your story. Not only will it give your audience insight into where you are (perfect for travel bloggers!) but it also gives you the opportunity to be seen by a wider range of users. How? Instagram compiles the best stories from that location, into it’s own, location story. Viewers can see this story from the explore feed, or by searching the location. If your content ends up in this story that means it could be exposed to a much larger audience! I love this feature and use it often to get an extra boost in views. Much like the location sticker, this sticker allows you to describe your story with a hashtag. If your story performs well, it could be added to the subsequent hashtag story, sending your content far and wide! Viewers of this story will see text at the bottom that says “see more”. When they swipe up they will be taken directly to the link you input! Game changer! Simply tap the ‘add this to your story’ button to repost! 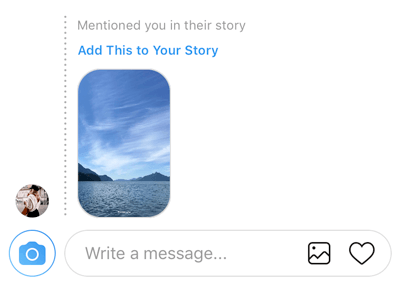 Now when your audience views your story, they can simply tap the image and a ‘see post’ button will appear. If they click that they will be taken directly to the shared post! ∙ Share your song with your audience! When a viewer watches your story they’ll be able to tap the image or the ‘play on Spotify’ text to instantly open the song in their Spotify app! This is a great way to share your interests with your audience.. You could even use the poll feature to ask if they liked it or not! 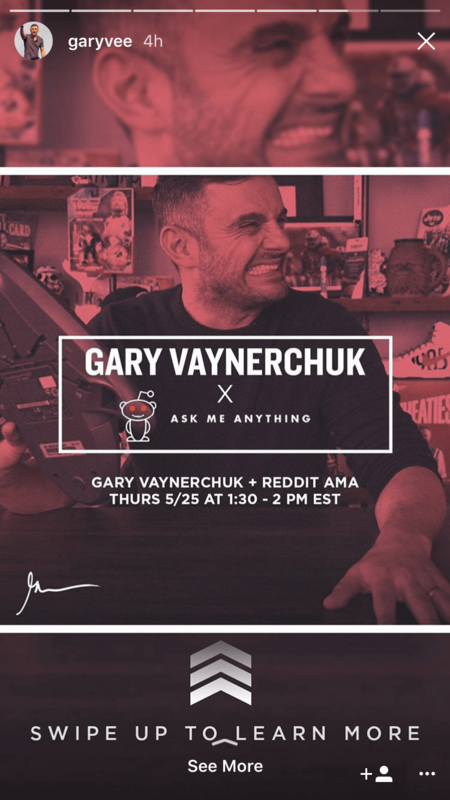 Alright kids, this is a BIG one! 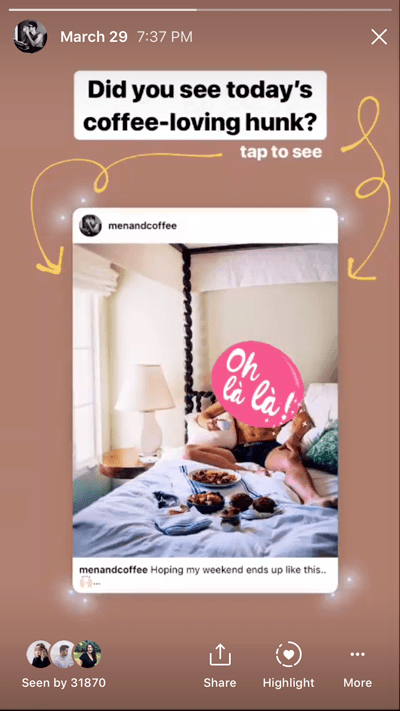 Instagram story highlights are a huge addition to Instagram and one that you should surely be taking advantage of. Story highlights are collections of images and videos that can be ‘pinned’ to your Instagram profile indefinitely. 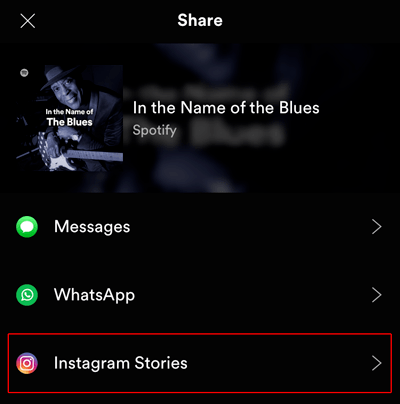 In contrast to an Instagram story that expires after 24 hours, these highlights can be used to broadcast your most important information, updates, promotions, etc. Keep in mind that your story highlight will play in the order that the stories were uploaded. That means you cannot re-arrange the order of images or video after the fact so plan ahead if you need to! Also note that you must keep your story live for a full 24 hours. If you delete your story before the 24 hours commences, those sections of your Instagram highlights will also be deleted. Check out my account @instawithalex to see how I’ve utilized the highlights feature! If you aren’t the type of person who wants your face on camera all the time (totally me, but I’m trying to get used to it..), then creating an “announcement” out of the tips and tricks mentioned above can be a great way to let your audience know that you posted a new photo, you’re hosting a sale or uploaded a new link to your bio. While this doesn’t immediately equate to a like or comment on your content, getting a potential customer into your DM’s can be far more valuable! Here you can start a conversation with them that leads to a sale, a collaboration, partnership, recommendation etc. It’s always extremely valuable to talk to your audience one on one, so ask a question or make a statement in your Instagram story, then encourage your viewers to reply! This is a great way to get clicks over to your website and potentially make some sales! By offering a very limited time sale via your Instagram story you give your loyal viewers an opportunity to save. 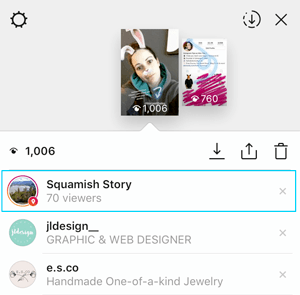 You could mention that you do this often in a new Instagram post to create hype and encourage more users to look out for your stories as well! With all of these features and many more to come (I’m certain!) 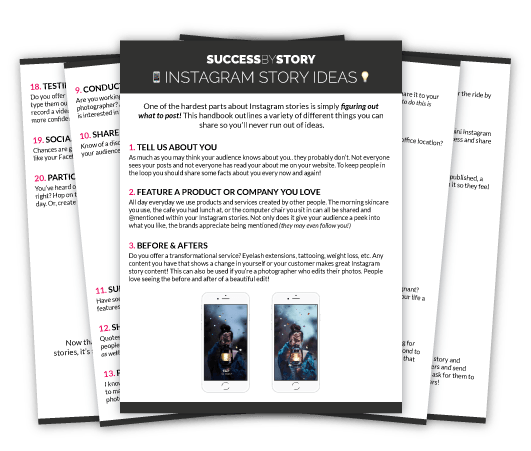 the opportunities to engage our audience, increase your engagement, and make more sales is totally possible with Instagram Stories! 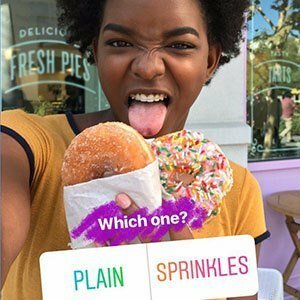 Are you using Instagram stories? Will you be adding any of these features to your strategy? Wow! I had no idea that instagram stories come with so many options! Right? I’m not sure why Instagram doesn’t just have their own comprehensive tutorial! Love your Alex, thank you! I am so behind with Instagram. I have Pinterest, Facebook, and Twitter down, but I really need to focus more on Instagram. Thank you so much for sharing. I’ll have to check out the stories feature. still no link option for mine 🙁 I wish i had that. I think you have to be an ‘official’ account, or verified or whatever. If i am not wrong you need to be over 15-20K to be able to use it. You need to have 10 000 followers or more. This feature is only available to user with 10,000 followers or more. Good blog, thanks for sharing! I have obviously not spent enough time getting the know Instagram stories!! I did not realise you could do so much! Thanks for the info. Amazing! So many useful tips! Th-no you! HI Alex, thanks for the really insightful article! Much appreciated! was hoping you could help, my IG account is listed as personal blog and ive updated my app as well as log in and out but still don’t have the option of adding a link to my story!